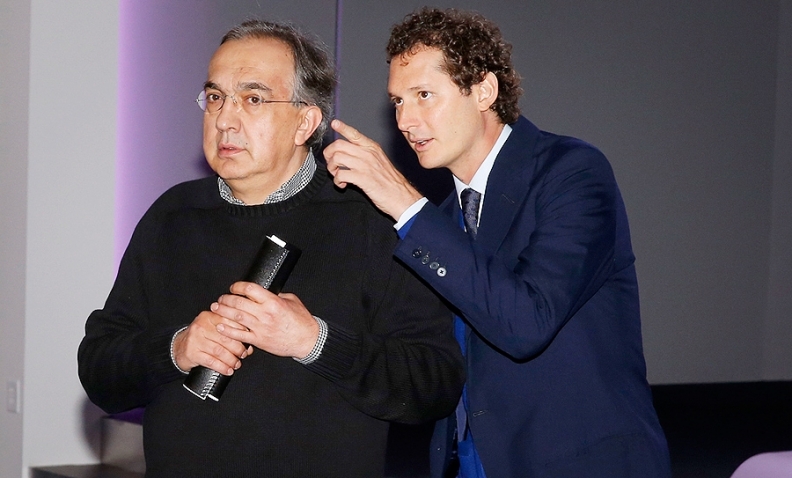 Fiat Chairman John Elkann, right, said he had spoken with Marchionne last week about his tenure. DETROIT -- Sergio Marchionne will remain CEO of Fiat Chrysler Automobiles through at least 2018 -- two years longer than previously indicated -- to oversee the rollout of the combined automaker’s five-year business plan. During questions with the media after a daylong presentation of Fiat Chrysler's 2014-18 strategy on Tuesday, Marchionne said he would stay through the full implementation of the plan and its ambitious financial goals. "I'm going to stay for the plan," Marchionne, 61, said. "I've got to make sure the plan gets delivered." In the same session, Fiat Group Chairman John Elkann said that he had spoken with Marchionne last week about his tenure atop the automaker. "I am confident that Sergio is staying with us," Elkann said. "We managed two more years." In January, Elkann had said Marchionne would lead the merged Fiat Chrysler through at least 2016. At that time, Elkann said Marchionne had agreed to stay through what was then described as a three-year plan. "In early May Fiat-Chrysler will unveil a new three-year business plan and we have agreed that Sergio will drive the company at least for the entire duration of this plan," Elkann said then. Earlier this year, the Italian press had speculated that Marchionne could leave after the presentation of the business plan and following a long-pursued deal that handed Fiat full control over Chrysler. Marchionne took the helm of Fiat a decade ago and in 2009 started running Chrysler following its U.S.-steered bankruptcy. He has led turnarounds at both companies. Marchionne had previously said he could step down in 2015. Some analysts feared uncertainty over his future at the combined company could cloud the prospects for Fiat Chrysler. He now has the delicate task of listing the new company and probably establishing its headquarters outside Fiat's home country of the last 115 years. Marchionne told reporters and analysts today that his management team was filled with talented people, including his eventual successor. But that unidentified person will remain in waiting for now. Said Elkann: "There’s no doubt that succession is an important topic, but it’s not an active topic."